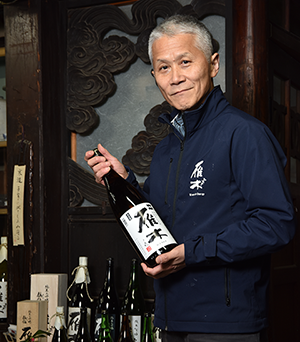 Brewing sake is the act of witnessing the birth of life where living matter creates new life of sake. It makes sense that ancient people was astonished by the mysteriousness of fermentation and sake became an essential part of rituals. We have to be thankful for working in such a privileged position everyday even we are not deities. Farmers who produce rice for us; the local nature which creates crystal clear water; microorganisms which work with us; the local people, our clients and vendors, who support us to create environment for sake brewing; colleagues who work and sweat together with; and our customers who enjoy our sake… We consider that our duty is to work hard everyday and not forget the gratitude to everyone and marvelous nature that help us stand on the stage of sake brewing. We, all the kurabito (sake brewers), will create “palatability” from our gratitude and communicate it to you. Company Name Yaoshin Shuzo K.K. 1950 Yaoshin Shoten K.K. was established. 1958 Yaoshin Liquor Trade K.K. split from Yaoshin Shoten K.K. 1969 Tomoji Kobayashi became the (third-generation) president of Yaoshin Shoten. 1994 Company name was changed to Yaoshin Shuzo K.K. 1994 Everyone except the master brewer Harada became employees. 1996 Matsuo Yaoya became the (fourth generation) president of Yaoshin Shuzo. 2004 Hisashige Kobayashi became the (fifth generation) president of Yaoshin Shuzo. 2006 Hisashige Kobayashi became also the master brewer along with the master brewer Harada retiring. All the businesses became consolidated in sake brewing.